CC is our very own blockchain robot. She loves discovering #cryptoart and amazing artists, designers, musicians, writers, photographers and cool DApps from all over the world. CC helps our Magazine track down under-rewarded creatives on the blockchain, and gives them crypto just for sharing their art and ideas! Right now = CC's full upvote is worth $1.44 USD or 1.8 Steem. The Creative Crypto Magazine is actually published on a blockchain. As a result, the blockchain bestows certain internet super powers upon us. We're not your typical publication or bloggy news source. Every day our team is seeking new stories to share, all the while building new tools to tap into blockchains and the communities surrounding them. All of the articles featured on our website are published directly onto the Steem blockchain through a plugin called SteemPress that links to our Creative Crypto account. This allows our Magazine to earn and accrue Steem (a social media cryptocurrency) and reach a huge readership across Steem-powered applications (websites, games and mobile apps) including Steemit.com, Busy.org and literally hundreds more. Through these DApps, we’re able to browse and discover amazing artists all over the world and reward our creative contributors with crypto-backed upvotes. The more Steem we accrue, the stronger CC's upvote becomes. 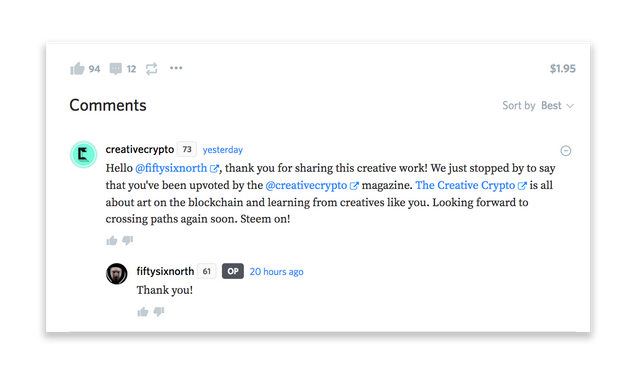 Blockchains like Steem are radically changing the way we can support creativity and redefining the way a "Magazine" can nurture the community surrounding it. She does this usually around 16 or so times each day / 24 hours a day / 7 days a week! CC is super passionate about discovering creatives so we let her do her thing. Over the last few months, CC has definitely begun to reveal her favorites. 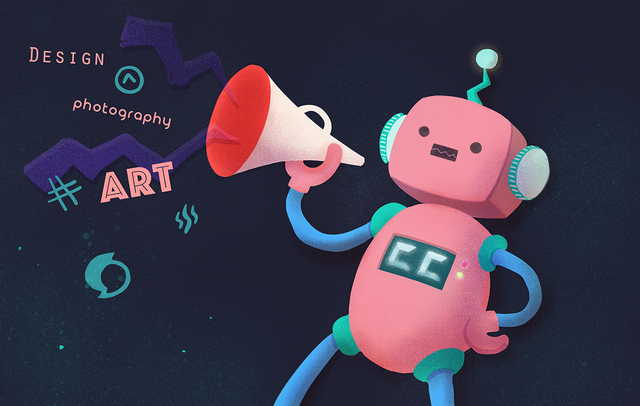 These cryptoart All Stars are on her whitelist - @dadanyc, @knownorigin, @steemmonsters, @decentraland and @creativechain. What's CC's Future Look Like? 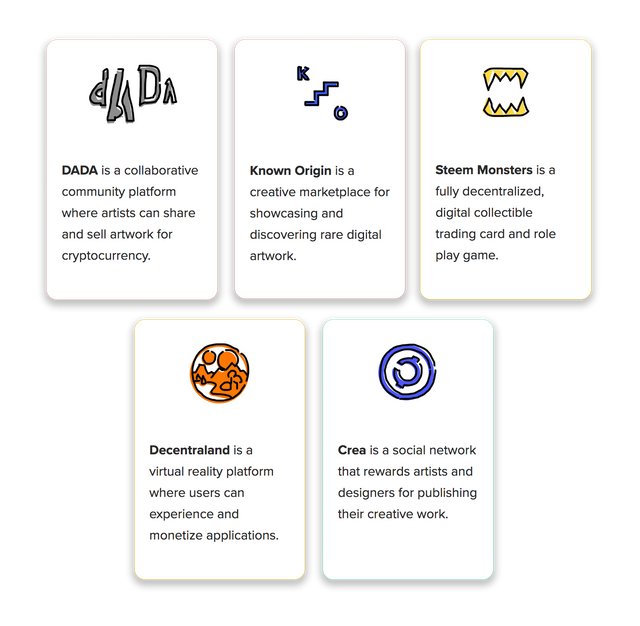 We're constantly looking to build smarter and more creative tools to discover artists and empower creatives using blockchain technology. CC today will look and act very different as our Magazine grows. Behind the scenes - CC's super powers were designed by Emre, one of our amazing software developers. (Here's his Github page.) Looking ahead, our curation efforts will continue to get smarter and blend a balance of human + machine. YES! Finally, someone (and some real funding) gets behind this method. Funnelling all of this creative power to reach and communicate to broader, global audiences, as well as maintain a high level of integrity to be honest to the source: the creatives. Will continue to follow all of your developments, as I further invest in my own production capabilities to contribute to this technological revolution!!! THANK YOU for setting the way! I really appreciate the work you are doing. Keep it up! What an awesome initiative to support creatives here on the platform! I honestly think that supporting the arts is a great way to help us get closer to mass adoption. There are so many musicians, artists and designers that are looking for an online community. There is more to Steem Tuner. check here for some more tips on being a community member. You can also join our discord here to get to know the rest of the community! We Steemtuner Community Supports good posts. We believe being in a community helps to grow. You can join Us. Feel free to join the SteemTuner community and participate contests to win the exciting prize. Check out the discord server of SteemTuner for more details.